EJ has global developmental delay (GDD) and sensory processing issues, including cortical visual impairment (CVI). She loves all things sensory, from the simplest of things like the wind on her face, to banging loudly on a drum, to being swung and spun around. EJ isn’t really interested in most toys, and when she is, most often she doesn’t play in the way intended – unless it’s a shaker! For birthday and Christmas we’ve come to the conclusion it’s easier all round if we put together a wish lists for our F&F who want to buy EJ a gift (and of course Santa!). We’ve found people are much happier knowing they will get something she’ll enjoy, or something useful. Over the years there have been some real big favourites and I thought I might list them here incase they help give some present inspiration! 1. 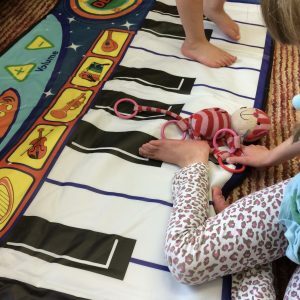 Giant Piano Mat: EJ loves all things musical, so this piano mat from John Lewis is the first of a number of musical toys on our list of favourites! If you are as old as I am, think ‘Big’, the film with Tom Hanks, but a little smaller! We got this for EJ last Christmas and it’s been something we love to get out to play with regularly (I say get out as it folds up and can be tucked away when not being used). I have to say the demo tune and background rhythms are a bit of a pain for us, as they are activated by big bright tempting looking buttons and quite often distract both kids from just playing with the keys! However, otherwise it’s a lovely interactive activity we can all enjoy and with the keys being so large and in black and white (high contrast colours) EJ is able to isolate different sounds easily. 2. Electronic Drumsticks: Another musical one, and also from John Lewis (I promise this is not a sponsored post! ), EJ’s auntie made a great find with these fab electronic drumsticks last Christmas. Perfect for EJ as you shake them in the air to activate the drumming sounds…plus…they light up! Brilliant! 3. Percussion: EJ LOVES shaking and banging and jingling! She also likes putting things in her mouth, so our favourite instruments have been by Halilit where the bells and any metal parts/choke hazards are enclosed in the casings. 4. 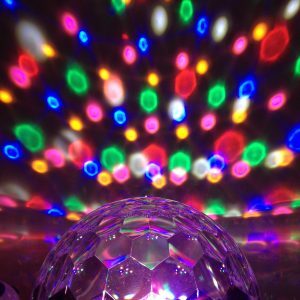 Disco Ball Light: This is a fab light which projects a rotating and colour changing pattern onto the ceiling and walls. We got ours from a fab local garden centre (Scotsdales), found among their christmas decorations. It has a function to play music too, however we usually just use it as a light with our iPod playing so we may have found something cheaper with just the light function …. or there’s even this little handheld one from Tiger which would make a great stocking filler! Both kids love the lights and EJ’s little brother often asks to have it switched on when we have some downtime after school and nursery. It really does make the whole room into a sensory experience and I have to say I quite enjoy lying down on the floor with the children watching the colours rotate on the ceiling myself! 5. 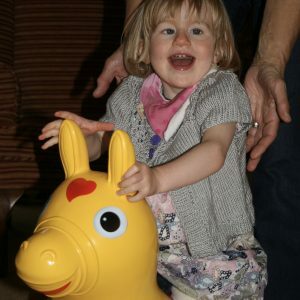 Rody Horse: We got Buttercup (renamed by EJ’s big cousin) the inflatable (space hopper style) horse when EJ was 2 years old. A piece of physio equipment cunningly disguised as a toy, or should that be the other way around!? As you can see by the big grin on her face, he was easily accepted as a toy! He’s been great for developing core strength and providing some vestibular stimulation in the form of bouncing and rocking. He’s still going strong and is also a hit with EJ’s little brother as well as cousins and friends. This is one of the few ride on toys that you can get in larger sizes for bigger kids and there’s another more mainstream brand, Happy Hopperz, who also make a very similar toy in bigger sizes too! 6. Twilight Turtle: We love our Twilight Turtle, in fact, so much so the kids have one each and we have a Twilight Ladybird too (the link is to the main US page but they are available to buy from UK retailers). It’s a great subtle nightlight, with 3 colour options, which also projects stars, and a moon, up onto the ceiling. It switches itself off after about 20 minutes but has a very easy on/off push button for kids who are able to operate simple switches. 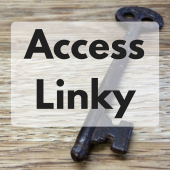 One of it’s benefits is that it’s pretty portable, so we often take it if we stay away from home and it instantly transforms a strange darkened bedroom into somewhere more familiar. 7. Spinning Egg Chair: This isn’t a toy as such, but we got EJ a spinning egg chair from Ikea for her Christmas two years ago. She is very much a sensory seeker and loves activities like swinging and spinning that provide vestibular stimulation. It’s also a very calming activity for her and can help to balance her mood. It’s quite a cute little chair too and fits perfectly with the style of her bedroom. Both kids still love it, and in fact quite often manage to climb in together for a spin round! 8. 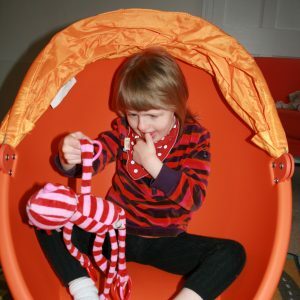 Alley Cat: This is EJ’s favourite comfort toy (spot the red and pink cat toy in the piano mat and egg chair photos!)! She took to it the minute she saw it, one of the first toys she truly engaged with, at around 18 months old! It’s from the Jelly Kitten range by Jelly Cat. This particular toy is discontinued (so thankfully we have a back up…. shhhh don’t tell EJ there are 2 Alley Cats in circualation! ), however they do have a selection of similar toys. I think this particular toy has been most successful for EJ as she loves to shake things, and also to wave objects in her peripheral vision. Alley Cat has a rattle inside and as EJ waves her, the rings on her swinging arms, legs and tail clink together too. The bright red colour is also ideal for someone with visual impairments like EJ. 9. Books! : It may not sound like a very inspired suggestion but we love books! They are always a winner! 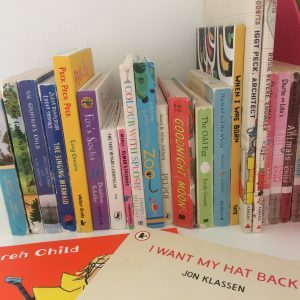 All children benefit from being read to, it can only help with language development and communication, bonding and slots into daily routines. EJ doesn’t really follow a story or always engage with the reading activity but she does have favourites, whether that’s the ones with more visual elements, or because some lend themselves to actions and signs (or to me making funny noises that catch her attention! ), i’m not sure, but reading is a lovely family activity that we all enjoy. See some of our favourites on my Pinterest board. 10. Experiences: As I say, EJ is not really fussed by toys in the same way as many children are. She can be as happy with a foil emergency blanket (or indeed the wrapping paper!) as she would be with an expensive toy! She doesn’t have expectations of receiving gifts at Christmas or birthdays so gifting of experiences are of as much (if not more) value to her than something she can interact with immediately. Things such as National Trust membership (EJ loves being outdoors and among the sights, sounds and smells of the woods & gardens), theatre tickets (we’ve been to relaxed performances of the local panto and EJ loved it), swimming lessons, skating (we did wheelchair skating last year and it was fantastic!) would all be brilliant for her. 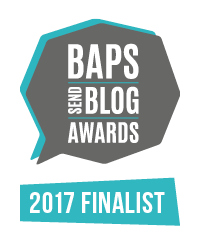 I hope our list of favourite gifts may give some ideas to the F&F of other little sensory seekers out there, however not all those with sensory processing issues are sensory seekers like EJ and some of her most favourite things may be the stuff of nightmares for those with sensory aversions! 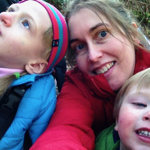 This Christmas Gift Guide by SkintMomma gives some great general advice for choosing presents for children with special needs – they key advice (I think) being – just ask! Next Post Why should we? My pleasure! Your post gives fantastic advice! What a great list. I do keep considering one of those chairs from IKEA – especially know the spinning stool we have is falling apart. The kids do love ours and it also makes a nice little reading den with the hood pulled over! Ohhh a great list. I think Biggest would love electronic drumsticks and the spinning chair. I will have to look into them for Christmas! Thanks so much for linking with #SpectrumSunday. We hope you come back next time.